Today, we are pleased to introduce the newest limited edition Droid Life gear. In the past, we let you choose from either a hoodie or a t-shirt, however, we are bringing you both options today as we are that pleased with this design. As usual, it doesn’t have an official name, but we are leaning towards this being the “Community” shirt. No word better describes the group of people that amass here every day at Droid Life. If you are confused by the design, we’ll have to point you in the direction of the John, Paul, Ringo, & George shirt that Experimental Jetset did a few years back. The shirt was wildly popular, helping kick off a wave of ideas for t-shirt makers across the globe. The four terms we have chosen not only symbolize the current state of Android tech, but they really do reference the lives that we all have invested in. 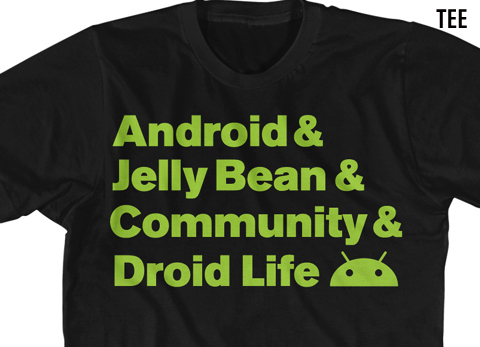 Android at the top as the star of the show, Jelly Bean as the newest version of it, Community to show our respect to you, and Droid Life because through this medium, we have been given the opportunity to bring it all together. Again, we couldn’t be more pleased with the design, the black, and the first ever DL zip hoodie. We hope you enjoy. As of this moment, you have 4 days to order before it is gone forever. The t-shirt is made up of a 100% cotton American Apparel tee in black. The graphic is printed with soft-hand ink in Android green. If you haven’t owned an American Apparel cotton t-shirt before, let me just tell you, that you are missing out. They do make some of the finer cotton products around. Plus, who doesn’t need a new black tee in their wardrobe? Sizes for men range from small through 3XL. Sizes for women range from small through 2XL. If you are not interested in black and want the same design on an Asphalt color shirt, please email Dion. For the first time ever, we are doing a zip hoodie. In the past, it was all about the pullover, but the zip hoodie is much more functional, especially for those of us that spend more than 30 seconds on our hair in the morning. 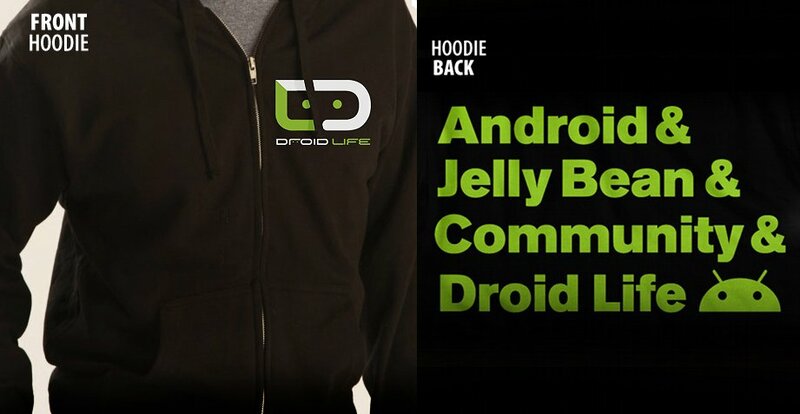 On the front, we have a simple Droid Life logo in 2-color (yes, men, we skipped the pink this time). 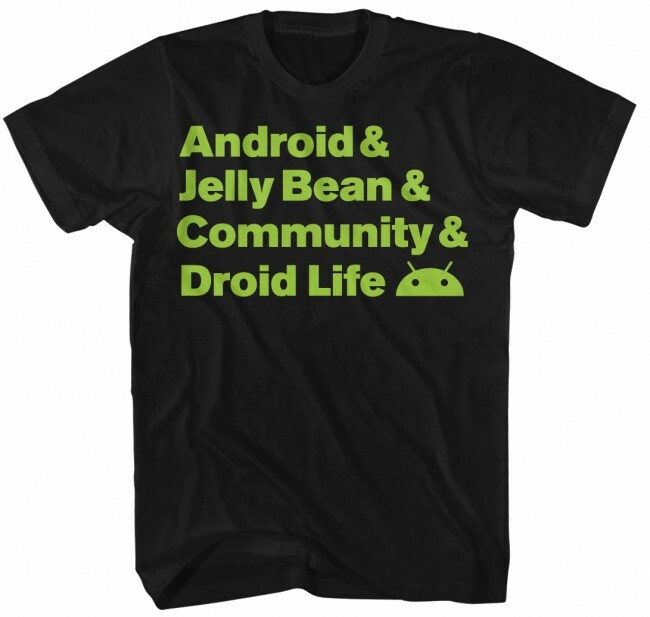 On the back, you will find the “Community” design in the same Android green as the t-shirt. The sweatshirt itself is a black Tultex 80% cotton, 20% poly fleece with the zip front, so it should be extra comfy. Sizing is unisex, ranging from small to 3XL. Since this is an exclusive and limited edition, you only have from today through Sunday (8/5) at midnight Pacific to order. After that, this design is gone forever. Once we close up shop on orders, the shirts will be printed and start shipping out on Tuesday (8/7). Both the t-shirt and zip hoodie are available at the Andy Limited store.